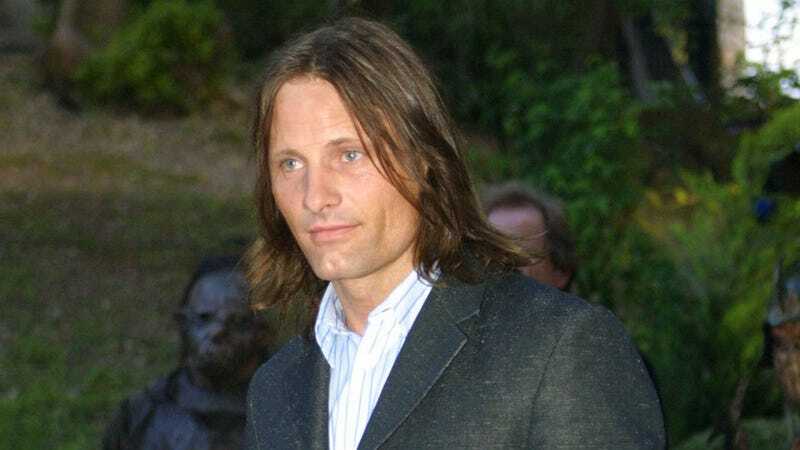 Viggo Mortensen in 2001, when he played the 87-year-old Aragorn in The Lord Of The Rings. There’s been a lot of speculation on what sort of stories Amazon’s extremely expensive new Lord Of The Rings show will offer up for content-hungry Tolkien fans: A recreation of the events of the Peter Jackson films? (Feels redundant.) A wacky roommate sitcom, set in the heaven-esque Grey Havens? (Can’t imagine they’d need all that money for that.) A Smaug-based talk show? Gimli’s Guide To Good Grub? Hobbit Babies? Kind of the latter, as it turns out, with fan site TheOneRing.net reporting that the series’ first season will apparently center on the adventures of the young King Aragorn in his pre-Return days, shortly after the events recounted in The Hobbit. (Consider this your reminder that, in J.R.R. Tolkien’s world, some human beings live to ridiculously old ages; Aragorn was canonically 87 when the primary action of The Lord Of The Rings takes place, which is pretty good no matter how weathered Viggo might have looked.) According to TheOneRing, “multiple” Amazon sources have confirmed that the show will focus on young Thorongil (a.k.a. Strider, a.k.a. Estel, a.k.a. Wingfoot—Tolkien also really liked nicknames) as he comes of age, learns to be a Ranger, and, again, spends, like 50 years prepping for his big day in the sun. This is all still speculation, of course, but it makes a certain sense: Aragorn’s always been depicted as a young, handsome, charismatic dude; in a narrative less interested than Tolkien’s was in humility and the strength of the meek, he’d be the classical hero who ends up saving the day. We can’t imagine—no matter how much Jeff Bezos might demand it—that the show will ever go full Game Of Thrones in terms of its R-rated content, but there’s definitely a certain Jon Snow promise to following Aragorn as he finds out he’s the last scion of a dying line (complete with a cool elf girlfriend, to boot).